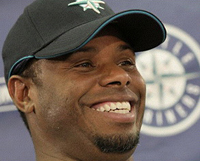 After 20 years of terrorizing pitchers in both leagues, and dazzling fans in every baseball city with his speed and athleticism (not to mention his mega-watt smile), Ken Griffey Jr. is heading back to familiar stomping grounds (Seattle, WA) for the home stretch of his incredible career. While the 39-year-old Griffey is clearly past his prime, last year’s combined .249 average, 18 homers and 71 RBIs (split between play with The Reds and The White Sox) showed he can still be productive and a solid team leader. So it’s back to Seattle for Junior, a city that treated him like returning royalty whenever he came back in town…despite the fact that he was sitting in the visitors’ dugout. Some would argue Griffey is not the right fit for a team going through a youth movement, where he will definitely be the “elder statesman” and go-to guy. All of this is fine with Griffey, who sounds very much like a big brother when he says he expects people to get along with each other in the Mariners’ clubhouse. "I knew exactly where I was going. I think I know this clubhouse better than most people here," said baseball's active leader with 611 home runs, with a youthful grin. "I said I was gonna come back, and I did...It's the right thing at the right time," said Griffey on February 21st at his first press conference after re-joining Seattle at their Peoria, AZ spring training camp. He appeared at ease as he took questions from reporters, and looked like the Griffey of old as he pounded line drives much to the delight of photographers who turned batting practice into a paparazzi feeding-frenzy. "I may not hit 50 home run or 40 or even 30…but I can do the little things to help a team win,” Junior said. One of those will be working closely with Ichiro, perhaps serving as a liaison between the Japanese leadoff hitter and some of his teammates who were less than enamored with him last season. Griffey, who spent the first 11 years of his career with the Mariners, had narrowed his 2009 season search to Seattle, where he starred from 1989-99, and the Atlanta Braves, a team his father played for in the ‘80s and long on his wish list. That’s when the man called “The Kid” showed his maturity by reaching out to two of baseball’s living legends (and fellow members of the 500 Home Run Club) Willie Mays and Hank Aaron. 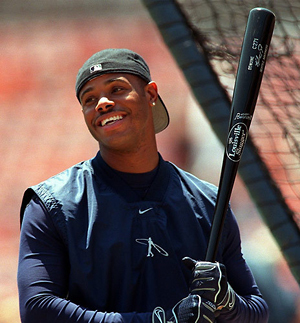 According to his agent Brian Goldberg, Griffey spoke by phone with both Mays and Aaron, and the prime topic was his legacy and how a return to Seattle would solidify it. "Kenny made his own decision," Mays said in a phone interview with The Seattle Times from his California home. "I just talked to him about different things. What I got out of it, he wanted to take care of his family. It was his decision, not mine." "Ken said it was a legacy thing," said Mariners’ President Chuck Armstrong. "When he talked to Willie, that was the word he used — legacy, and what it meant to him and the Giants, and what Junior means to this franchise. He [Mays] told him that would live on long after his own lifetime, and Ken's lifetime." Both Hall of Famers were speaking from personal experience. While Mays will be forever known as a Giant, he played 135 forgettable games with the Mets in his early 40s. Aaron, a perennial All-Star with the Braves, hit .234 and .229 at the tail end of his career as a Milwaukee Brewer. And Griffey showed he was listening by returning to the franchise where he made the American League All-Star team and won a Gold Glove every year in the 1990s, and was such a local treasure that Safeco Field is known as "The House That Griffey Built." But, according to an ESPN.com article, it might have been Griffey's teenage daughter, Taryn, who sealed the deal, not the Hall of Famers. Griffey's agent, Brian Goldberg, told ESPN that "She [Taryn] told him, 'Dad, I really think you should go back to the Mariners and not have any regrets about how you finished.' That kind of put it over the top." Sounds like Ken isn’t the only Griffey showing his maturity.